Sturdy design with galvanised metal casing made of high strength steel for use in tough environments. Protective frame made of steel tubes protect controls, quick connectors, cable sockets and torch connector during transport and operation in confined areas. The protective frame also acts as the handle and is insulated from the chassis which is equipped with plastic rails for easy movement. Electronically controlled feeding gives accurate and stable arc. The 4-wheel feeder mechanism with grooves in both feed roll and pressure roll gives stable feeding and low wear on the wire, all to avoid operational disturbances. The feeder is available with Ø30 mm feed rolls for wires up toØ1.2 mm. ESAB LogicPump ELP *, provides automatic start of the water pump when a water cooled gun is connected. This prevents overheating of the welding torch. 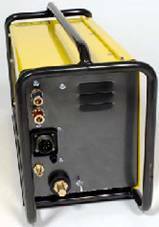 Designed to meet the most rigid safety standard IEC 60974-5 with low voltage (42 V/AC) operations and overload protection to eliminate breakdowns. The feeder is equipped with a safety switch where the operator can deactivate the torch trigger. The safety switch can connect power to an optional heating element during night time to protect the wire spool against humidity. The feeder mechanism is easy to access and all wear parts can be exchanged without the need for tools. One single pressure device makes it easy to adjust the appropriate feeding pressure. 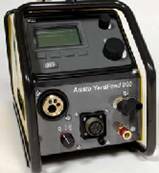 • 2/4 stroke, simplifies handling of the welding torch. • Integrated handle in a protective frame simplifies the handling through man-holes and other difficult to access areas. • Creep start, gas pre-flow and hot start provide a soft and more direct start with less spatter. • Crater filling, adjustable burn-back time and post gas provides a smooth finish, extend the lifetime of the contact tip and guarantees no cracks at the end. • Pre-programmed synergic lines, to ensure optimum settings with a wide choice of materials, wire dimensions and gas combinations. • Quick connectors- shortest possible set-up times. 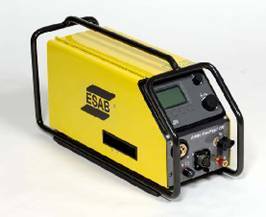 • ESAB LogicPump ELP *, secures automatic start of water pump by connection of a water cooled welding torch. • TrueArcVoltage SystemTM, measures the correct arc voltage value independent of the length of the connection cable, return cable or welding gun.